Linking house and garden in a warm and natural way, landscaping is a superb way of enhancing a living area and adding value to a property. Raised or ground level timber decking will provide the perfect spot for seating, a children’s play area or al-fresco meals in the sun. This is not meant to be a definitive list, but it does cover all of the major points you will need to consider before starting any work outside. It should help prevent you missing some important details and may even give you new ideas that you may not have thought about yet. So you have a garden and you want to redesign it. 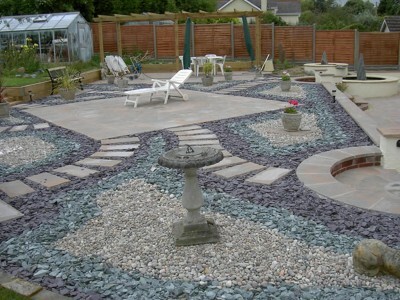 Perhaps you’ve just moved in to a property and want to create your own garden, or you might just want to revamp your existing garden to create a new atmosphere or space. Well, what next? It has to be said that “a major part of the work needed in getting the garden you want is down to planning!”. There is a big difference between having a vision of your ideal garden, and getting that idea realised.To help you, we have put together a list of some things to think about whilst planning your new garden. To start off, you will need to assess your current garden, checking for existing elements that you want to keep (and maybe make a feature out of), and also for elements you want to remove. Your Garden’s Aspect – Is your garden north/south/east/west facing? This will affect the type of plants you can grow, and which areas of the garden receive sun and at what times of day. Soil Type – Is it heavy, light, dry, wet, acidic, neutral, or alkaline? Again this affects the type of plants you can grow, and what soil modifications you may need. Plant Exposure – Is it exposed to wind, frost, or sheltered? This can affect the type of plants you can grow, and how well your plants do. It also affects your comfort in the garden! Soil Drainage – Do you have areas of standing water, or is it dry? Unless you want a bog garden, you may need to condition the soil to help excess water drain away. Topography – Is your garden level or sloping, and to what extent? If it slopes, are you happy with it? Do you want to terrace the garden, or level it off? At this stage, you should also note down how good access into and out of your garden is. Take measurements of any access routes into your garden. This will be important once work starts as poor access will certainly slow things down! Once you have done this survey of your garden, you should have a better idea of what is possible to achieve given the physical aspects of it. It’s now time to think about what you want from your garden. Think about how it will be used, now and in the future. This can play a big part in determining what features will be included in the final design. Also note down your own desires for features and garden elements. Pathways – to link up areas of the garden, and provide clean, safe and ‘dry’ access. Storage Areas – eg: a shed to store garden tools, lawnmowers etc. Composting Area – to help discard your organic waste, and provide a free source of nutrient rich compost.